Following our introduction to the olive wood creations, our "all things olive" tour continued with a 90-minute drive north, past the forests of Ajloun, near the Greco-Roman ruins of Jerash. We had signed up with a local tour group (www.engagingcultures.com), but had opted to drive our own car and follow their van, so the baby could have her carseat. This was not only the first time we were driving out of Amman, but it was also the first time we were driving any distance and blowing the dust off our new (2006) Mitsubishi Pajero. It was slightly harrowing, as the van driver drove faster than I was typically used to, especially in a new larger vehicle. But I managed to keep up with the help of tight abs, constantly tense shoulders and never-blinking eyes. We drove north out of Amman, through smaller towns and cities, past farms and road-side fruit stands, past little kiosks with blinking blue lights indicating "coffee here", past multiple sellers of ceramic jugs, pillars and the occasional lion. We passed by the sign for Ajloun Forest Reserve, as well as the 2,000+ year-old ruins of Jerash, noting to return on another date for proper explorations of each. After driving through two towns and their windy hilly roads, we came upon Ajloun Castle, high on the hill overlooking practically everything (yes, it's also on the "visit here" list). Here is where we met our host for the day, Abu Anas. From here, Abu Anas led us to his olive farm, which consisted of true off-roading over rutted dirt "roads" and up and over some rather breath-holding angled hills. The van couldn't make it up the last ascent, so they pulled off to the side but we were told to drive on up, so with my foot to the floor and being ever so thankful there was no ice present, we bumped up the last hill to park at the top. The tour group had arranged for us to come out and spend a few hours picking olives, have lunch, and get to know our hosts. Abu Anas quickly gathered us all around, and explained quite simply that our job was to either, a) remove the olives from the tree branches by hand, or b) pick up the olives from the tarps laid under the trees. Every single olive was to be gathered and collected in the buckets, regardless of size or condition (squashed ones, too). 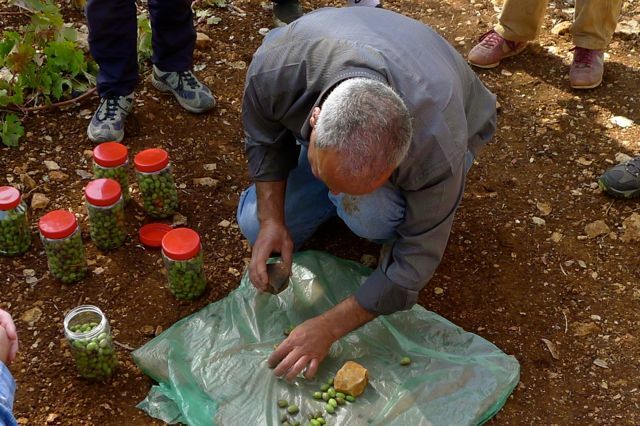 Abu Anas' family, including his sons, nephews, wife and her sisters, were also there picking and plucking and bucketing far faster than any of us. There were ladders for those willing to reach out and up for the top olives, and the rest of us gathered around a few trees and started picking or gathering. Even the kids got involved, including Bean. Though we did have to repeatedly explain to her to put the olives in the bucket, not take them out. 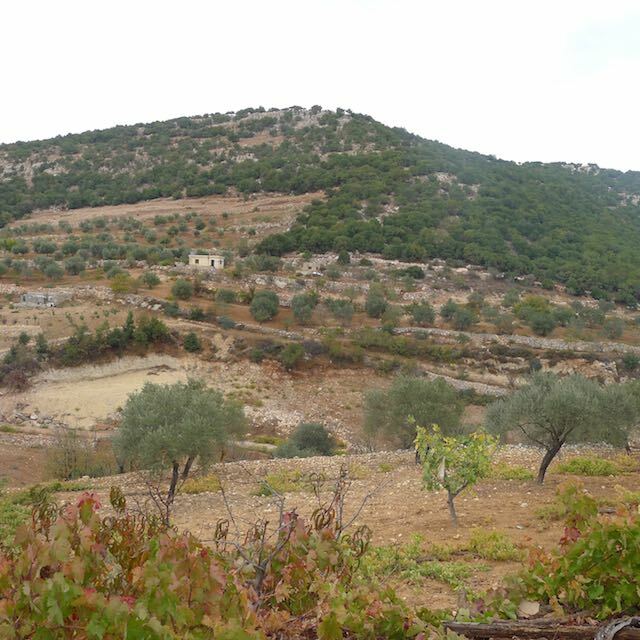 Abu Anas' farm is located on approximately 5,000 square meters of very hilly land. It was beautiful scenery, but very rocky and muddy, though luckily it hadn't rained recently so we weren't caked in it. I couldn't begin to imagine the number of olive trees he has, but this is harvesting season, so every olive must be gathered. Some are taken to a factory where they're squeezed into oil, but others are packaged up for regular olive consumption. We were all given two jars of fresh olives to take home, as well as the recipe to make them edible (apparently olives don't just fall off the tree ready for the closest martini or vegan tapenade). We picked and gathered olives for an hour or so, and I say that loosely as I spent more time taking pictures and watching Bean toddle around, than I did gathering olives. But then Abu Anas kindly said we were done and gathered us around for a home-cooked meal. As vegetarians there was nothing Bean and I could eat, but I'd packed her lunch so we munched on carrots and cucumbers and pasta while the others partook of the meal. We did enjoy some very sweet tea that was constantly brewing over a lit fire (boy, it's not surprising that it can be difficult to find a "small" bag of sugar in the stores here considering the vats they go through daily just in tea). The ride home was far less tense, as we felt we could dawdle a little once we were through the small towns and back on the main road that would lead us directly into Amman. The roads led us from the bottom of the valleys to the tops of the hills gazing across for miles. It's such beautiful scenery I couldn't stop commenting on, or photographing, it; though I did take breaks to capture the road-side fun as well, including some now-appreciated olive stands. So, in the span of just two weeks, we had been thoroughly educated in all things olive (yes, for those type-As out there, I know we didn't actually see the olive oil process, but hey, it's also on the "visit here" list). So, if you just happen to be in the neighborhood in a month, swing by for a taste of some genuine Abu Anas olives and come admire our beautiful salad servers and we promise to tell you all about "all things olive."